It's not cheap but it works great, right up to full 1080p and surround sources. Easy to setup and use. Fast. Reliable. So you want a fantastic video to accompany your gig or DJ set. You've got movies sync'd with Ableton Live and camera's, laptops and video gear coming out of your ears. Thing is, unless you can get it all out onto multiple screens and projectors it'll stay cooped up. HDAnywhere's kit is industrial strength gear that takes HDMI ins and sends them down Cat 6 networking cables. At the far end of each a small box converts the signal back to HDMI for a TV, projector, 150ft jumbotron, whatever. "HDAnywhere's 4x4 has four HDMI ins (ready for laptops, Blu-ray or DVD players, cameras - whatever) and four Ethernet outs"
Slinging HDMI leads around in a gig environment is a no go due to their limited length and flexibility, but Cat 6 (ie, computer Ethernet cable) can go 100m and is cheap, bendy and ultra reliable. 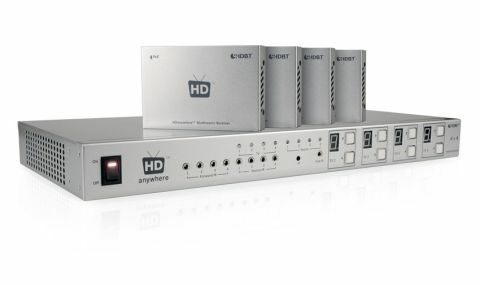 HDAnywhere's 4x4 has four HDMI ins (ready for laptops, Blu-ray or DVD players, cameras - whatever) and four Ethernet outs. A simple push button system on the front (or the supplied IR remote) denotes which video input appears at which output. Switching is fast and reliable, meaning a lighting/visual accomplice can cut between the sources sending any one to any or all of your displays. And the receivers at the end of the lines will even return the IR control for switching sources (or even starting and stopping DVDs and the like), so you can orchestrate your video show from any of your displays. Go for the new (£500 extra) 'power over Ethernet' option and the remote converter boxes get their power down the Cat 6 cable, forgoing the need for supplies and sockets, making rapid builds, breakdowns and awkward installs a breeze. If you need simpler systems HDAnywhere make single source/many display options for any budget.